Branson Missouri construstion services including: building residential & commercial, garage door sales and installation, service work. Service Door prides themselves on providing high quality residential and commercial overhead door products and services. 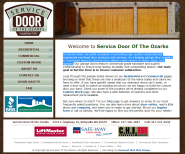 They are a leading garage door supplier in Southwest Missouri. Service Door offers a wide variety of styles, sizes, and options to choose from.